For over a decade, Crag has been working with local communities to hold the line against new fossil fuel terminals and pipelines along the Oregon Coast, including in Coos Bay and the lower Columbia River estuary. Even though the Federal Energy Regulatory Commission regulates these energy projects, developers also must comply with local land use laws. Given our experience in enforcing Oregon’s land use laws, Crag is uniquely positioned to take on this work and build on our relationships with Columbia Riverkeeper, Oregon Shores Conservation Coalition, Native American tribes, and local citizens. We’ve scored a series of major land use victories over the years—three of which are highlighted below—and we intend to keep up the pressure going forward! In 2010, Crag scored a victory against the Bradwood Landing facility on the Columbia River upstream from Astoria. Working with Columbia Riverkeeper, Crag attorneys Chris Winter and Courtney Johnson argued that the proposed project was not a “small to medium sized water-dependent industrial development,” and that the County had artificially limited its review of the scale of the development to include only the land-based facility itself— excluding any dredging, docking areas and pipelines associated with the facility. The Oregon Court of Appeals hammered the final nail in the coffin for the project, finding that the County could not just minimize adverse impacts on fishing grounds and tribal resources, it had to limit development that could cause significant adverse impacts to these resources. 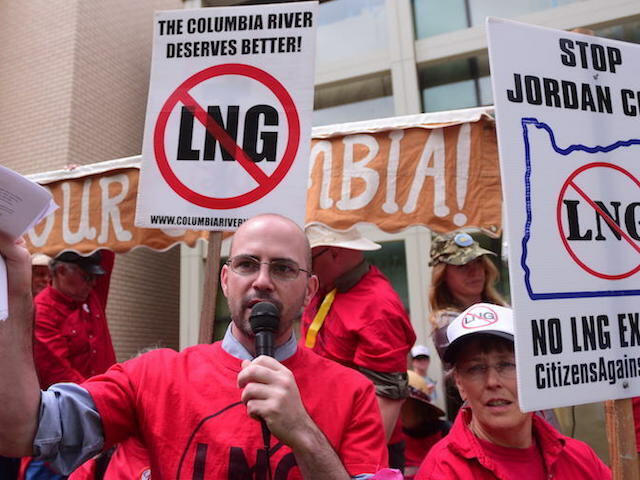 From 2011 to 2016, Crag worked with both Columbia Riverkeeper and Oregon Shores to challenge and ultimately defeat the Warrenton LNG export project. Crag used Oregon’s land use laws to demonstrate the proposal’s risks to the community and the significant threats to intertidal wetland habitat critical to endangered salmon survival. The project required dredging 109 acres of estuary and filling 35 acres of wetland just inside the mouth of the Columbia River, near important recreational and commercial fishing grounds. Based on our presentation, the Hearings Officer determined that the project would unreasonably interfere with public trust rights—namely, impacts on fish, fishing, fish habitat, and on-going fish recovery efforts. In November of 2017, we secured a victory for Oregon Shores Conservation Coalition and local citizens in the long-running fight against the Jordan Cove LNG terminal proposed for Coos Bay. Not only would this project threaten local residents with disaster and impact over 200 waterways, it also would lock us into a dirty energy economy through the production of six million metric tons of liquefied natural gas and 30 million tons of carbon dioxide equivalent per year. Through our advocacy, Oregon’s Land Use Board of Appeals (the board) found that the developer could not ensure compliance with local land use safeguards for estuaries and tidal lands. In particular, the board found that the operator had not addressed the project’s significant impacts to the Coos Bay estuary, including impacts to commercial and recreational fisheries and access to shellfish beds. In response a companion challenge by the Confederated Tribes of Coos, Lower Umpqua, and Siuslaw Indians, The board also issued a strong statement regarding the requirements to include input of local Tribes during the land use review process. This victory is a huge step toward helping Oregon meet its greenhouse gas reduction goals.